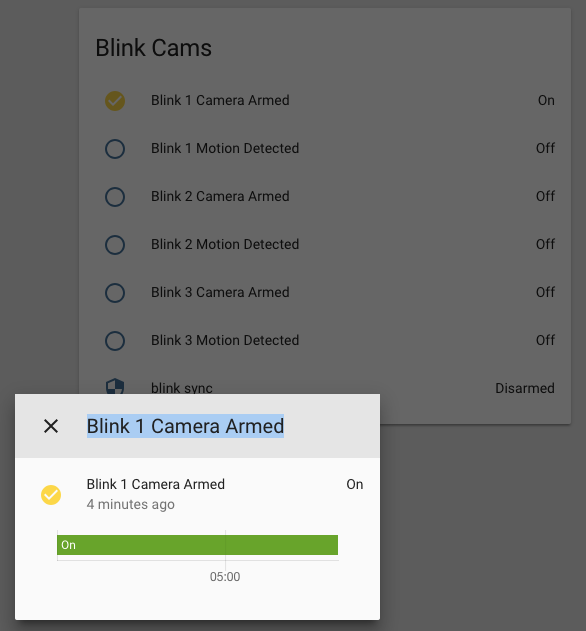 This is a complete overhaul of the Blink component in homeassistant. The previous version relied on old API methods that Blink has since deprecated, causing the component to be mostly non-functional. This component still does not support multiple sync units (since the blinkpy API also doesn't) but both have be restructured in such a way to (hopefully) allow a more seamless add in the future. I will list off breaking changes of the component, and then go into a bit more detail about what I changed, since this is a pretty big PR. binary_sensor.blink_nameofcamera_motion_detected or through a camera's attributes with the motion_detected key. Excessive polling will drain battery (and possibly result in you account being locked out from accessing the API), so be aware of this. I feel like I'm not properly utilizing async but don't know enough. Any advice here is greatly appreciated. When the image is clicked on, I'd like to return the last recorded clip but have not figured out a way to do that. Blink does not have a streaming option that I know of, and also requires some custom headers to be sent with a request (containing an authorization token). Not sure how to approach this. As mentioned before, multi-sync units are not supported, and since I only have one it's difficult for me to test. If someone else wants to contribute to this, I'd greatly appreciate it! Ok, how do I get WIP to not set the status of this PR to in progress? It's grabbing info from my first commit , but I can't seems to figure out how to reset that status. Load the platforms via discovery from component and pass config options via discovery_info to platforms, or store config in hass.data. Import the blink domain as another name. This platform belongs to the alarm_control_panel domain. Would something like BLINK_DATA work? Don't add this method if it has the same result as arm away. Ok, I wasn't really sure what to do with that. Only reason I added it was because I noticed that the alarm panel on the front end displays a button for both Arm Home and Arm Away, so wasn't sure if I needed to add functionality for both. Yeah, we don't have supported features yet for the alarm control panel. So we can't do anything about that yet. Use dict[key] for required config keys. Why shouldn't this be a binary sensor platform? Honestly, I'm just not sure which makes more sense and I really don't have a strong opinion either way. If you think binary_sensormakes more sense than a sensor platform, that's good enough for me. If it only has two states, it should be a binary sensor platform 👍. Import the blink domain as another name. """Return the device state attributes.""" Static info not related to state shouldn't be part of state attributes. We have device info property for that. Although that requires config entry. Rebase and update the commit message to remove the WIP tag. - Motion detection now working! Moved blink.py to own folder. Added service hints. OK, I think I fixed all of the requests. I also moved blink.py into a separate folder and added a services.yaml file to that folder in order to add some descriptions for the available platform services. """Call save video service handler.""" Nothing is checking this return value. Please be consistent and either use tuples or lists in the sensor type dicts. Since they are constants they will not change. Services should be registered under a domain. Use the correct variable ie DOMAIN. Is this doing I/O? If so, we should optimize and put it in the outer loop. It's not doing I/O, but I think it's more logical to put in the outer loop regardless. Thanks for the docs PR @fronzbot! Use the sync version of the register method, not the async one. It doesn't matter that we're registering an async service handler. We're still in a sync context here. I have 3 Blinks. I can see entities for each but not able to update them, neither using blink.blink_update. Only able to get image from blink 1. Any help is welcome.